05/22/2011 14:00Pictures of 2011 expedition online. We have sorted through most of our pictures from the traverse and put some of them online. If you are interested in featuring some of these pictures in full format/size, please contact us. On another note, the Rocky Mountain Outlook published an article of an interview with us. Thanks again to all that have helped to make the trip happening. Stay tuned for more publications and presentations! 04/22/2011 14:10Great Divide Traverse finished! We're done! Literally. We just skiied the last leg today and are happy to have finally finished the trip. In short words for now: The trip was a great adventure. Lots of great weather, bad weather, wonderful as well as very critical situations, no major injuries, avalanches, crevasse and creek falls, broken equipment, food shortage, exhaustion, great friendship. Name it, we've had it all. The trip took us 20 days, including two complete rest days and two days that were partial rest days due to conditions (sitting out weather or avalanche threat). We'll update the website soon with lots of information. Stay tuned for lots of pictures, our exact google earth track, GPS tracks, information on caches, route information and much more. Also, there will be most likely a public presentation about the trip. Now we're celebrating with lots of burgers, beer and deserts! Thanks to all the people who helped to make this trip a great success, in particular our families for their support, Kellen and Ed for meeting us at Alexandra, and many other people! The boys started today from Marmot Basin up the Tonquin Valley towards Wates Gibson hut. Trace their current position here. The second food cache has been established. Carsten hitched-hiked from Canmore to Jasper on Tuesday. Big thanks to Jane from Jasper Lodge who picked me up in Banff and drove me all the way to Jasper and around Jasper for a partial food pickup from Gerry's uncle, some shopping, some drinks and driving me to the hostel. Thanks to the Jasper HI Hostel staff for lending me a toboggan for sledding in the cache. Hitched hiked to Sunwapta Falls and managed to drag the entire cache the first 16km to Athabasca Crossing with the toboggan due to a warden skidoo track. After that, trailbreaking became hard and deep and the sled was abandoned and I went the full way to Fortress Lake twice. Got out on Friday evening and still got back to Lake Louise were I got stuck with hitch hiking. After a night at the hostel I went back to Canmore to meet Dan and Gerry. The first food cache is established. Carsten skiied it in yesterday in an epic 15h round trip. Welcome to the website of our trip. This website is intended to provide you with useful information, pictures and reports. Check out our current position feature! This map will be updated online during the trip. 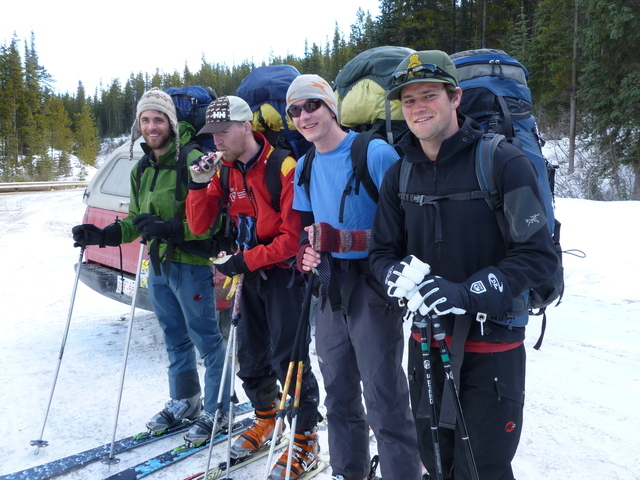 Also check out the pictures of previous trips in the area to get a feel of what the great divide traverse is all about. Preparations are currently in full swing. Thanks to Gerry the chef for preparing numerous dried dinners for the entire team. Carsten will be arriving in Calgary on March 24 and will ski in all the food caches subsequently. Once everything is ready, we hope to start the trip on April 2nd or 3rd.